That's what I did the second time around. I took a long break from the blog after my second miscarriage, which happened days after my entire family shared a wonderful Thanksgiving meal around our table on Orcas Island, and feasted on a bird raised on the island, that we helped harvest. I treasure these times when we all sit down and eat with one another. It's not because of the conversation--we're not the most exciting of families being mostly introverts, with three too many engineers. It's the sharing of food, preparing it together, and eating it around the same table. The collective "ooohs" and "mmmm's" and quiet toasting with a nice glass of wine. I've thought a lot about that meal, when I shared my second pregnancy with my family, and then called them a few days later to let them know our bad luck had continued. I had wanted to write about grace, about being grateful, but after that loss, I felt I had nothing to say. It was Father's Day on Sunday. My family gathered around a table without me, quietly as always I presume. I spent the weekend in the garden, building another hoophouse for eggplant and peppers, preparing bird netting for the blueberries, strawberries, and currants, and catching up on harvesting an abundance of lettuces, cilantro, chervil, parsley, radishes, snap peas, turnips, and strawberries. I would have liked to have spent the day with my family, but I am grateful for the time I spent in the garden. My fingers ache as I type this, tired of stringing this and pulling that. I think of my father's fingers, and his hands, placed around his Thanksgiving plate. A plate meticulously organized, as an engineer would. Turkey to the side - root vegetables not touching anything else - a small mountain of mashed potatoes caved in the center of the plate - gravy carefully welled up inside. I am careful like my father, and meticulous. I am pensive like he is too. But I am a better pretender than he. I can play extrovert, dance, sing, shout, scream. I've never heard my father scream. I follow his moods by watching the slightest wince of smile, or lightness in his eyes. My father is a mystery to me and to many. But I am thankful for his patience, for his mind, for his subtle way of sharing things that matter, like catching crab, or learning to drive a dinghy. My first sighting of the beautiful islands I now call home, was with my father, my mother, and my two siblings, packed tightly for two weeks on our 26 SeaRay - island hopping. I, always a fish, was frustrated the water was so cold. But I swam in it anyway, and learned to relish it. We came back many more times over the years, and as we grew, so did the boat. I got older, camped out, even made out in tents, dinghy'd in to harbors to buy ice cream but really to check out the gas boys and dock hands. There was a lot of infatuation on these trips, but what I fell in love with was the sparkle of the moon on the water at night. I am grateful for my father, for sharing his love of the water and these islands with me. He planted the seed unwittingly; and we made it grow. I am grateful for my husband, a father in so many ways, a dreamer, who believes, who knows, anything is possible. Anything is possible. I often marvel at the life we have nurtured here. I am also grateful for the gorgeous little red strawberries presenting with abundance in my garden, along with radishes, and the tenderest of lettuces. 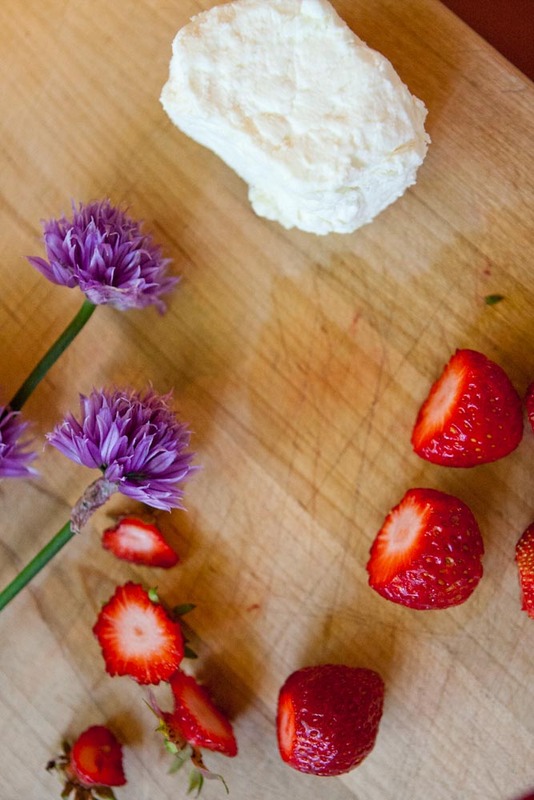 While I love a shortcake, I like pairing strawberries with savory, especially in salads. If you have time, make a big bottle of your own strawberry vinegar - in December, you'll be overwhelmed with grace. Preheat oven to 350 degrees. Prep your vegetables. Once oven is at temperature, spread almonds on a baking sheet and toast in the oven for 10-15 minutes, until just beginning to brown. Set aside. Prepare the vinaigrette. Muddle shallots, honey, salt, and vinegar together. Whisk in olive oil until it emulsifies. This recipe makes more than you need. The vinaigrette will last up to two weeks in the fridge. Use it again ! Toss lettuce in a large bowl with about 1/2 cup of the vinaigrette. Add more as desired. Scatter strawberries, radishes, and almonds on top. Finish with crumbled goat cheese and several grindings of pepper. Alternatively you can plate the salads individually. Garnish with chive flowers if you have them. If you do only part of this recipe, make this vinegar. It will add brightness to many winter days months away. And it's easy - it just takes a little time. In a large kilner style jar, or container with a lid, add strawberries and vinegar. Gently muddle the strawberries (just a little to get the juices going). Make sure that whatever container you use, the strawberries will be completely covered with vinegar. Cover, and store in a dark spot in the pantry or kitchen for 4 to 5 days, stirring occasionally. Do not leave it somewhere it will sit in the sun. Once it's ready, the strawberries will be nearly falling apart and the liquid will be quite red. Strain using a cheesecloth lined sieve, and let drain overnight. I don't recommend squeezing the mixture and forcing it through - this leaves you with cloudy vinegar. Pour into a sterilized bottle and seal. Will last up to one year. If you're particularly thrifty, you could make something out of the leftover strawberries -heat them with an equal amount of sugar to 221 degrees, several grinds of black pepper and you'll have a fantastic dessert or cheese topping.